I stumbled upon The Shattered Court by chance. In fact I didn’t even realize it was an Adult book until I was reading. This is one of those I was attracted by the cover and was more than pleasantly surprised. I loved the book and it does such a great job of creating this world that has the appeal that young adult books have but is definitely adult. I like girls like Sophie who curiosity and quicker witted nature override their fear. It makes her brave but also thoughtful of how things will play out by her decisions. I only continued to love her as she grew throughout the book. She is full of fierce sass but can also keep it to herself when the situation calls.She knows how to follow court protocol but that doesn’t make her a follower. She is also not afraid of confrontation which is pretty awesome. Cameron actually surprised me. Reading the description I expected him to be one way and then boom, he shocked me right at the beginning. As we get to know him you can see how he does take his duty seriously but he is also kind and gentle. I loved the plot. The idea of a society that even though it has a monarchy has a Royal Witches who demand respect. The only draw back is that the witches are only allowed to practice Earth Magic in Anglion and are bound as soon as they come into their power. This is so they can be controlled. They are also married off by the king/queen’s discretion.Used as a political motivator. The Royal Witches enjoy a wealthy life but as long as they are comfortable with being the courts pawn. Where not too far off in Illyvan, witches enjoy freedom and are allowed to practice the four arts. I loved the world building. It was both extensive for demographically but also political. We really get a good look at how politics work in the Anglion court. 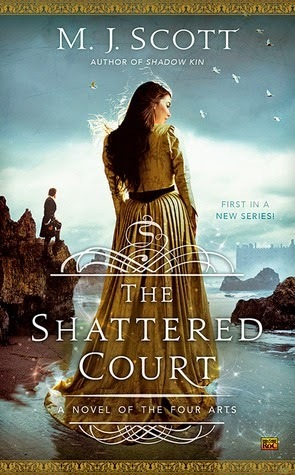 The Shattered Court spends more time with the politics, it felt like it slowed down for me but it was still interesting at the same time. I felt like I finished reading and really had a grasp on what was going on. I also liked the progression of Sophie’s magic. She didn’t suddenly know everything all at once, which makes sense. It’s not like she came into these new powers and was wielding them like someone with experience. She demonstrates how strong she is but we get to see her develop with them. I am hoping to see some more magic in the next book. I loved Sophie and Cameron’s relationship. I love these types where they act more as a partnership even though they are crazy for each other. They manage to balance each other out and have their own strengths. There is no question on whether or not they are in this together. They manage to capture the elusive never go to bed angry. I can’t wait to read the next book. I’m excited to see what happens with Sophie and Cameron. The book left on a little bit of a cliff hanger but it was one of those great kind that you can picture the movie screen fading to black. I hope we get to see more magic and I’m sure we will get to learn more about the different kinds. Definitely give this book a try if you are a Fantasy/Magic fan. The author's name sounds familiar... I can't think of what she wrote, but I'm pretty sure I've seen positive reviews. This sounds like an awesome read, thanks for sharing!